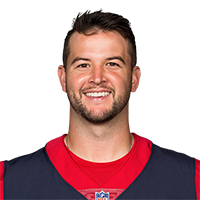 McCarron agreed to a one-year, $3 million contract with the Texans on Tuesday, Aaron Wilson of the Houston Chronicle reports. 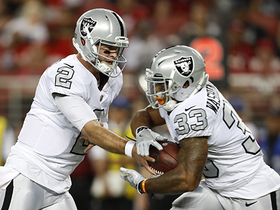 Analysis: McCarron, a former fifth-round pick, spent his first four seasons with the Bengals before backing up Derek Carr in Oakland last season. He will now be the No. 2 quarterback behind Deshaun Watson in Houston. The 27-year-old has only started three games in his career, all of which came in 2015. McCarron was released by the Raiders on Thursday, Adam Schefter of ESPN reports. Analysis: Trading a fifth-round pick for McCarron did not appear to be one of head coach Jon Gruden's finest moments last season, and cutting the quarterback with time left on his contract is doing that perception no favors. McCarron will now return to the free-agent market with hopes of finding a new spot to compete for a No. 2 gig. One possible landing spot is with the Bengals, who recently signed McCarron's old quarterbacks coach with the Raiders, Brian Callahan, as offensive coordinator. General manager Mike Mayock expressed a desire for McCarron to remain with the Raiders in 2019, Michael Gehlken of the Las Vegas Review-Journal reports. "I think [coach] Jon [Gruden] and I both believe that the backup quarterback is one snap away from playing. It's important to have someone like McCarron ready to go," Mayock said Wednesday at the NFL Scouting Combine. Analysis: Oakland raised eyebrows around the league last offseason by shipping a fifth-round pick to Buffalo in exchange for McCarron. The 2014 fifth-round pick ultimately logged just 12 snaps and threw three passes for the Raiders in 2018. He'll be owed a $3 million roster bonus if he remains on the Raiders' roster March 15, with the majority of his contract then becoming guaranteed on the 17th. McCarron was traded to the Raiders from the Bills on Saturday for a fifth-round pick, Adam Schefter of ESPN reports. Analysis: Apparently displeased with his backup quarterback situation, Raiders coach Jon Gruden is bringing in a replacement for EJ Manuel and Connor Cook. It isn't entirely clear that McCarron will be an upgrade, given that he completed just 46 percent of his passes for 5.7 yards per attempt with the Bills this preseason. McCarron will not be part of the Bills' roster cuts Saturday, John Wawrow of the Associated Press reports. Analysis: We'll never know if McCarron saved his job with a fantastic comeback to rescue what began as a horrible start Thursday against the Bears. 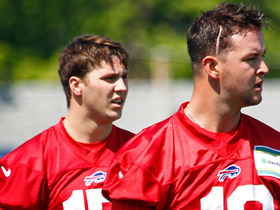 The bigger news to come out of Buffalo will be what the 1-2-3 pecking order is between McCarron, Nathan Peterman and franchise QB Josh Allen, an order that has seemingly flipped around all summer. The team has only a few more days, if that, to publicly settle the issue. Coach Sean McDermott said late Thursday that McCarron is "absolutely in the race" and the fact that the quarterback played the entire final preseason game is not a reflection of McCarron's roster status, The Buffalo News reports. Analysis: McCarron was awful for much of the game Thursday, but he did rally the team to victory following 20-0 and 27-3 deficits, albeit against Chicago's third and fourth stringers. While it seems more likely Nathan Peterman or rookie Josh Allen will get the Week 1 start after both were rested Thursday, it might behoove the Bills to keep three quarterbacks around, seeing as they haven't had much of an idea as to which one is worthy of the starting job going back several months. McCarron completed 13 of 34 passes for 156 yards, three touchdowns and two interceptions in Thursday's preseason 28-27 win over the Bears, adding six carries for 54 yards and a touchdown while playing the entire game. Coach Sean McDermott said McCarron (shoulder) will practice Monday with no restrictions and is "ready to go," Joe Buscaglia of WKBW.com reports. Analysis: McCarron was hurt in the team's second preseason game, but the injury didn't turn out to be as bad as it looked, so he'll return to full practice after missing just a week and a half. Josh Allen didn't do anything to separate himself from the other two potential starters during Sunday's preseason loss to the Bengals, so the week ahead is crucial toward the Week 1 fates of McCarron, Allen and Nathan Peterman, who may be the surprising current leader in the race. Coach Sean McDermott said McCarron (shoulder) -- who was only able to serve as the emergency third quarterback Sunday in the team's preseason game against the Bengals -- should be ready to practice again in the next couple of days, Chris Brown of the Bills' official site reports. McCarron (shoulder) will be limited at Friday's practice, Mike Rodak of ESPN.com reports. McCarron (shoulder) threw lightly during individual position drills Thursday, Chris Brown of the Bills' official site reports. Analysis: Initial reports last week suggested that McCarron would face a multi-week absence due to what was thought to be a fractured collarbone. He avoided that fate, but is still being eased back into things. McCarron's return to practice, however, does keep him in the mix to compete for the team's Week 1 starting QB assignment. Meanwhile, top draft pick Josh Allen will have a chance to improve his standing in that competition Sunday against the Bengals, which will mark his first preseason start. McCarron still has some shoulder soreness, but he'll return to practice Wednesday as a limited participant, Tom Pelissero of NFL.com reports. Analysis: McCarron avoided the collarbone fracture that was initially feared, but there's no guarantee he'll be available for Sunday's preseason game against the Bengals. The Bills plan to give Josh Allen most of the first-team reps in practice leading up to the game, per Joe Buscaglia of WKBW.com. McCarron (collarbone) is expected to return to practice soon, per Adam Schefter of ESPN. Analysis: Initial reports that the quarterback would face a multi-week absence due to a fractured collarbone have been altered upon further review. Assuming McCarron is able to resume practice within a reasonable time frame, the Bills' QB battle will once again feature three competitors. Nathan Peterman and Josh Allen, who will start Sunday's preseason game against the Bengals, are also in the mix on that front. Tests have revealed that McCarron did not suffer a fracture in his right (throwing) collarbone, Adam Schefter of ESPN reports. Analysis: That's not to say that the QB won't miss any action, but we'll at least temporarily back away from the assumption that McCarron is in for a multi-week absence. In any case, it will be rookie Josh Allen's turn to start Sunday's preseason game against the Bengals, per Mike Rodak of ESPN.com. Nathan Peterman started the team's first preseason game and McCarron got the nod in Buffalo's second contest. McCarron is slated to undergo further tests on his right (throwing) collarbone/shoulder area, Chris Brown of the Bills' official site reports. Though the Bills initially classified the injury McCarron suffered Friday night as a right shoulder issue, ESPN's Mike Rodak and Vic Carucci of the Buffalo News are reporting that the QB suffered a hairline fracture in his right (throwing) collarbone. McCarron suffered a hairline fracture of his collarbone during the first quarter of Friday's preseason game against the Browns, Vic Carucci of The Buffalo News reports. Analysis: Unable to return after suffering what was originally reported as a shoulder injury, McCarron is now looking at the possibility of a long-term absence. If he is indeed forced to the sideline for an extended period of time, Nathan Peterman and Josh Allen would be left in a two-way battle for the starting quarterback job. McCarron will start Friday night's preseason game against the Browns. Analysis: Josh Allen and Nathan Peterman figure to get some work as well, but McCarron will see snaps out of the gate Friday. He's currently in a close battle for the Bills' starting QB job with Peterman that could go either way in advance of Week 1. McCarron will practice Monday after suffering a minor right leg injury during Sunday's practice, Joe Buscaglia of WKBW.com reports. Analysis: McCarron will reportedly have his leg taped up, but it doesn't sound like this will hinder him much in his quest to win the top job over Nathan Peterman. The two are currently in a neck-and-neck battle and have been splitting first-team reps all training camp. 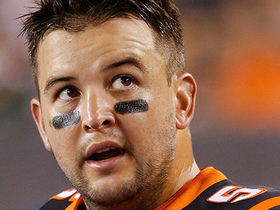 McCarron appeared to injure his lower right leg at Sunday's practice, Mike Rodak of ESPN.com reports. Analysis: Following a sack in 11-on-11 drills, McCarron came off the field with a visible limp and was examined by the medical staff. He proceeded to have his lower right leg stretched by a trainer on two different occasions, per Matthew Fairburn of The Athletic Buffalo. Although McCarron did his best to power through the injury, it'll be something to watch, especially in the midst of his job battle with Nathan Peterman. After playing with the second unit in Thursday's preseason opener, McCarron was back with the first unit for Friday's practice, Joe Buscaglia of WKBW.com reports. Analysis: The Bills continue to rotate McCarron and Nathan Peterman, both of whom played well against Carolina on Thursday. It would make sense that McCarron gets the start next week against the Browns, while the Bills continue to flip-flop the two candidates in practices. One of the two will start to gain some separation eventually, but it's close to a dead heat right now. McCarron completed seven of 10 passes for 116 yards in Thursday's preseason opener against the Panthers. He did not throw a touchdown or an interception. Analysis: Nathan Peterman started the game and worked with the first team, and even though McCarron posted a strong 108.8 rating, Peterman outplayed him by a tad in only throwing one bad pass while going 9-for-10 with a touchdown. The battle wasn't won or lost on this night, however, and we'd expect the two to continue flip-flopping with the first and second team until one starts to clearly separate himself from the other. 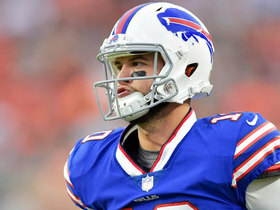 With Nathan Peterman starting Thursday against the Panthers, McCarron will enter the game in a reserve capacity, Mike Rodak of ESPN.com reports. 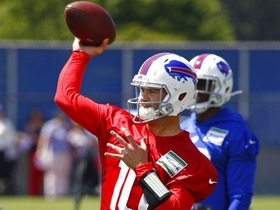 Analysis: Both quarterbacks have received reps with the first-team offense during the offseason program and training camp, but McCarron is yielding to Peterman in his first taste of exhibition action with the Bills. Since the team has been working a pre-planned rotation all summer, for now we're not going to read more into Peterman starting until the rotation starts to change. However, how each performs in the preseason opener is certainly important. After working ahead of Nathan Peterman for practices Wednesday and Thursday, McCarron was back with the second unit again Friday, Mitchell Courtney of the Bills' official site reports. "It was part of the plan from the beginning," said coach Sean McDermott. "Because we went red zone, we wanted to make sure that Nate [Peterman] and AJ [McCarron] had time in the red zone. If we stuck with the normal rotation, Nate [Peterman] would have gone again." Analysis: McCarron remains the guy that's looked best through the early part of training camp, though the battle hasn't sorted itself out yet and could continue all the way until the third preseason game. McCarron is taking first-team reps at Bills practice for the second consecutive day, Joe Buscaglia of WKBW.com reports. Analysis: The implication here is that this is a break from the regular routine, as McCarron and Nathan Peterman had previously been alternating days with the first-team offense, according to Mike Rodak of ESPN.com. It's a bit too early in camp to declare a clear-cut frontrunner, let alone a starter, but McCarron seems to be making the progress the Bills had hoped when they signed the former Bengal to a two-year deal this offseason. McCaron saw exclusive work with the first team during Sunday's training camp practice and looked good doing so, Jay Skurski of The Buffalo News reports. Analysis: Nathan Peterman will continue to get work with the first unit as well, but Peterman -- who looked fantastic in minicamps -- hasn't looked nearly as good early on in training camp. First-rounder Josh Allen will get some first-team looks as well, but for now McCarron remains a mild favorite over the other two guys to be the Week 1 starter. McCarron and Nathan Peterman are splitting first-team reps, Mike Rodak of ESPN.com reports. Analysis: Peterman worked with the starters Thursday but gave way to McCarron on Friday. Rookie first-round pick Josh Allen has been limited to third-team work, but he still has plenty of time to make his move throughout training camp and the preseason. It should be a wide-open battle to take the reins of an undermanned Buffalo offense. McCarron is likely to have more competition for the starting quarterback spot after the Bills traded up to select Josh Allen with the seventh overall selection in Thursday's first round. Coach Sean McDermott stated this week that the starting QB job will be decided through competition, Dominic LoVallo of BuffaloBills.com reports. "We've got open competition at the position. We've got two good players at the position," McDermott said in referring to McCarron and last year's fifth-rounder, Nathan Peterman. "Two, good, young players and we're excited about both of them. Both have done a lot of winning, albeit at the college level. Both quarterbacks have a lot of room to grow and are very encouraged about the opportunity to compete to start for the Buffalo Bills." 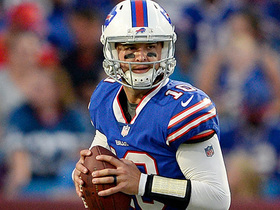 The Bills and McCarron agreed to a two-year contract Wednesday, Mike Rodak of ESPN.com reports. McCarron won the grievance he filed against the Bengals last spring and will become an unrestricted free agent March 14, Ian Rapoport of NFL Network reports. McCarron will receive an arbitration ruling Feb. 15 on his grievance to become an unrestricted free agent, Laurel Pfahler of the Dayton Daily News reports. 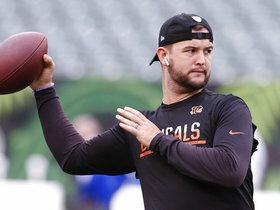 The Bengals agreed to trade McCarron to Cleveland, but the Browns failed to send documentation to the NFL prior to Tuesday's 4 p.m. EDT trade deadline, Mary Kay Cabot of The Cleveland Plain Dealer reports. Oakland Raiders quarterback A.J. McCarron completes his first pass as a Raider. 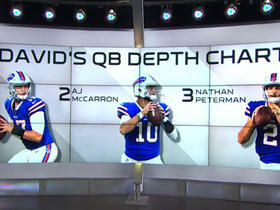 NFL Network's David Carr breaks down the tape on the Buffalo Bills' quarterback competition, discussing how he believes the depth chart should be listed currently, and why. 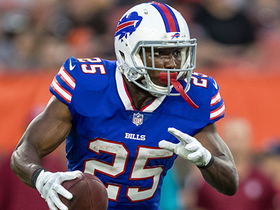 NFL Network's Tom Pelissero brings the latest information on the injuries to Bills QB AJ McCarron and running back LeSean McCoy. The "NFL Total Access" crew discuss an injury update on Buffalo Bills quarterback AJ McCarron's collarbone. NFL Network Insider Ian Rapoport brings the latest information on the collarbone injury suffered by Bills QB AJ McCarron. The "NFL Total Access" crew discusses which quarterback will end the season with more snaps, Buffalo Bills quarterback AJ McCarron or Josh Allen. The "Good Morning Football" crew debates which Bills QB will start more games between rookie QB Josh Allen and the remaining QBs on the team. NFL Network Insider Ian Rapoport reports that free agent quarterback A.J. McCarron has reached an agreement with the Buffalo Bills. The "Good Morning Football" crew debates if the Bills should start QB AJ McCarron over rookie QB Josh Allen. 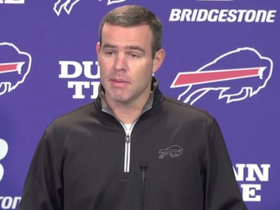 Listen to Buffalo Bills General Manager Brandon Beane talk about the conversations he had with Cleveland Browns Head Coach Hue Jackson and other coaches about quarterback AJ McCarron before the Bills signed him.